The MPC8308 processor is optimized for low-cost and low-power providing a highly integrated PowerQUICC® II Pro processor that addresses requirements of networking applications such as smart grid home energy gateways, data concentrators, wireless LAN access points, wireless femto base stations, consumer printing and industrial applications such as industrial control and factory automation. 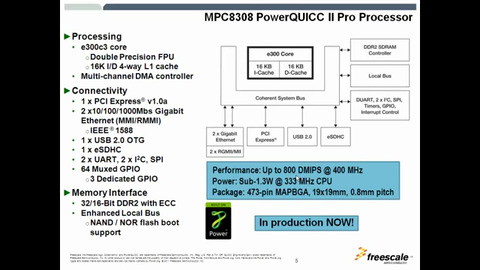 MPC8308 processor extends the PowerQUICC II Pro family combining higher CPU performance and high-speed peripherals with low power consumption at a very aggressive cost. For networking applications, the gigabit Ethernet MACs support connectivity to the wired network while the PCI Express® and SDIO interfaces offer connectivity to wireless LAN or 3G and 4G modem devices. The MPC8308 features integrated IEEE® 1588 version 2 time synchronization offering extremely precise clock synchronization for applications such as time-sensitive telecommunications services, industrial network switches, powerline networks and test/measurement devices.